Tonight Henry, Ceiling Cat [CC] Barbara Duncan, Kat, and myself ran down some of our favourite shows and inestigations during 2016. We realized we all still want to find a way to get UFOlogist documentarist Giorgio Tsoukalos as a guest. Henry brought in "Tabby" Cat Gasch, and later Tinamarie Ronan, not only a regular in our live chat room, but also as a medium and investigator, discussing staying at the haunted Gettysburg	Fairfield Inn, the next Paranormal View weekend event of such will be there April 21-23rd. CC reported our having listeners tonightin the US, the UK, Canada, Singapore, and Unknown. Steve Shockley was brought in, who will also be attending the April event again. Mid-South event was discussed, the possibility of the 2017 being held at Poasttown Elementary School. 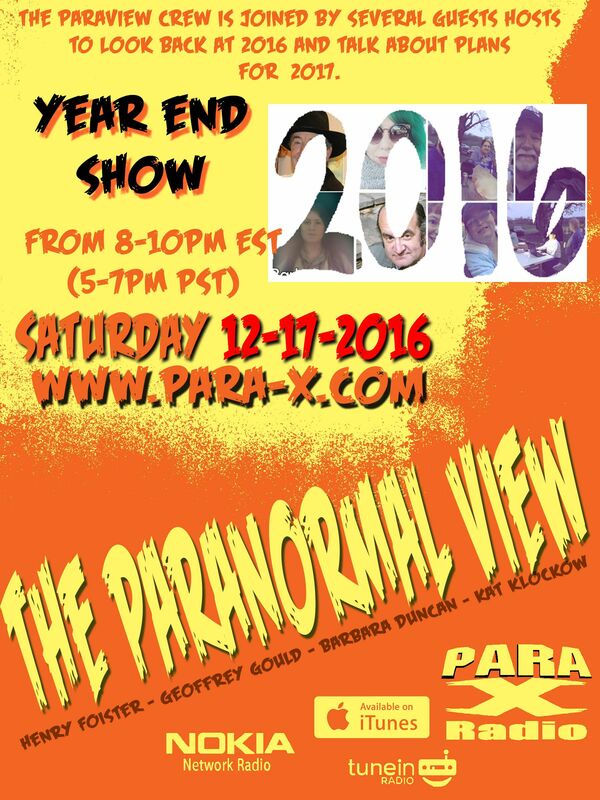 17 December 2016 Year End edition of The Paranormal View.